celebrating indie artists: The legendary Allee Willis' first live performance in 37 years! The legendary Allee Willis' first live performance in 37 years! In 1974, Allee Willis walked off stage in the middle of her own show. Now she's finally coming back! The Grammy, Emmy, Tony and Webby award-winning and nominated songwriter, artist, singer, designer, technologist, collector, and party thrower comes to the El Portal Theatre in beautiful North Hollywood for one night only of songs, stories, and party games. Sing-along to Willis' greatest hits like "September", "Boogie Wonderland", "Neutron Dance", "What Have I Done To Deserve This" and "I'll Be There For You (theme from Friends)"! Win valuable prizes! Watch her as she attempts to get through the evening without walking off stage for another 37 years! 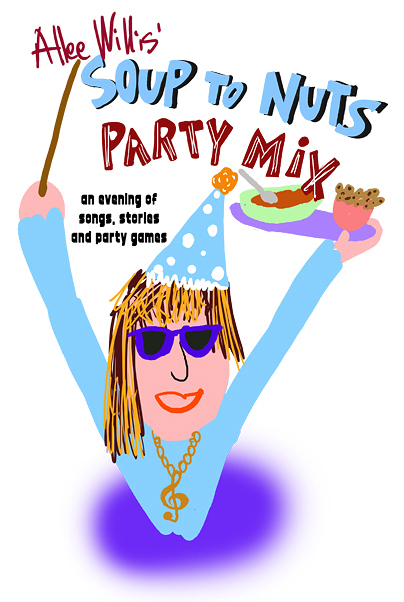 ALLEE WILLIS’ SOUP TO NUTS PARTY MIX – An evening of songs, stories and party games! Lobby opens at 7. Lots of kitschy food and drinks and beer and wine available.